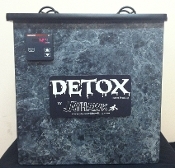 The Detox is the newest, safest and best tool for removing oil from deep in the surface of the bowling ball. It uses warm water (not Hot), a mild cleaning agent and Patent Pending Ultra-Sonic Transducers to quickly remove lane oil that has soaked deep into the pores of bowling balls. The UltraSonic transducers create millions of microscopic high energy bubbles that reach deep inside the surface of the ball to release the oil trapped in the cover stock. Not only does the Jayhawk Detox clean deeper and quicker, it does not subject the bowling ball to extreme temperatures over 125 degrees that can damage a ball and void factory warranties. Most other oil extraction devices from ovens, to hot water baths, to dishwashers and streamers subject the ball to temperatures in excess of 125. Not only is the Detox safer to bowling ball cover stocks, it works much quicker that most other devices which help the Pro Shop generate additional revenues. Help your bowlers bring back the Snap and increase their scores and give them new ball life with their old favorites while increasing your revenues. Please watch the Detox Video to view the deep Ultra-Sonic oil extraction technology in action, see how much performance gain can be achieved in only 20 minutes.